CurlyTop Tees is a collection of original artwork screen printed on to casual clothing. It includes pieces for men, women and children. These playful designs delight people of all ages. The artist, Aidan, is a young man living with Autism who loves to draw. Challenged by conventional language, art gives Aidan a voice. The view you’ll most often see of Aidan is his headful of curls as he works on his latest creation. It is that view that inspired our name, CurlyTop. This collection is an opportunity for a differently abled young man to design his future, and to create his notion of a meaningful day. Our logo features his “handsome” self-portrait. We hope that you enjoy Aidan’s voice and as much as we love sharing it with you! CurlyTop Tees donates 10% of it’s profits to help the differently abled. We hope that you will join us in our mission. Be Curly ~ Be Cause. Glendale – Aidan Dow may have difficulty communicating with his words, but his drawings speak volumes about his personality. A junior at Nicolet High School, Dow is on the autism spectrum and unable to string more than a couple sentences together at a time. 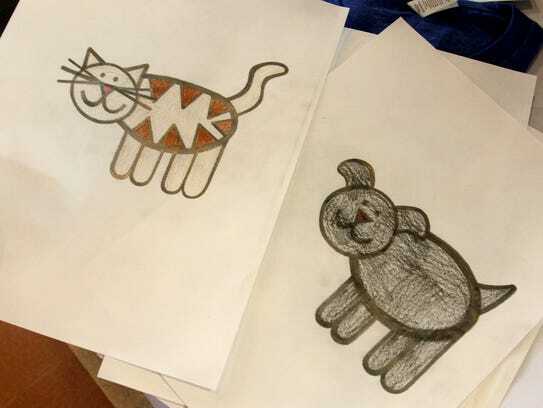 When he’s not learning life skills through Nicolet’s special education department, he spends most of his free time drawing pictures of elephants, cows and other animals. By breaking figures down to their simplest form, the 17-year-old self-trained artist uses geometric shapes to depict animals with smiling faces. His mother, Connie Lopez, said the drawings are representative of her son’s positive worldview. Aidan started drawing when he was 5 years old, and in the last 12 years, he has spent so much time crouched over drawing that his mother Connie is more familiar with seeing the top of his curly hair than his face. As Aidan nears high school graduation, Connie decided to start printing his drawing onto t-shirts through a company called Curly Top Tees. She said she has no idea what to expect from the venture, but she hopes the business will allow Aidan to turn his passion for drawing into a career. Connie invested several thousand dollars to print 300 shirts with alligators, elephants, bulls, cows and Aidan’s self-portrait. She said she feels like Aidan’s drawings are similar to the “Life is good” t-shirts, so there may be a market for them. Aidan and Connie sold the t-shirts for the first time during Nicolet’s Autumn Artisan Fair on Saturday, Nov. 5. The fair is organized by students in the special education program, but Aidan was the only student from the program to sell products at the fair. Proceeds from the event go to the Nicolet special education department’s community-based apartment, which students use to learn life skills such as cooking, cleaning and living life independently. Aidan’s t-shirts are available for sale at www.curlytoptees.com. Ten percent of the proceeds go to organizations that help people with disabilities. © 2017 CurlyTop Tees. All Rights Reserved.